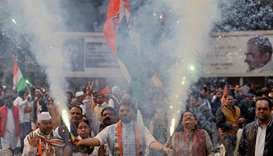 India's powerful Nehru-Gandhi dynasty launched a blistering attack Tuesday on Narendra Modi, as the opposition Congress party began election campaigning with a massive rally in the prime minister's home state. 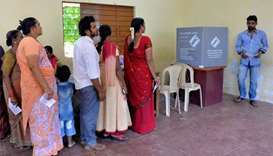 India's ruling party looked set to lose power in three key states, official vote counts showed on Tuesday, likely handing Prime Minister Narendra Modi his biggest defeat since he took office in 2014, and only months ahead of a general election. 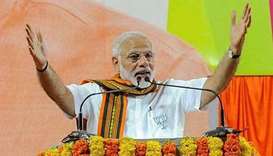 Modi's Bharatiya Janata Party (BJP) was the biggest winner in the Karnataka state election but has fallen short of a majority, sparking a scramble for power between the party and its arch rival Congress. Shashi Tharoor, a lawmaker from the opposition Indian National Congress, was also charged with cruelty in marriage, according to the charges filed by Delhi police in court. 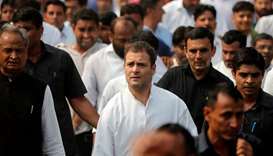 Both Narendra Modi and Congress leader Rahul Gandhi have campaigned hard in Karnataka, a state of 66 million people with diverse constituencies. 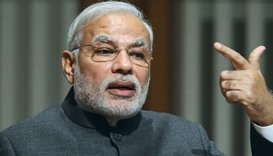 Indian Prime Minister Narendra Modi has thrown himself into a campaign to win a tight state election this weekend and secure a beachhead in the south, ahead of his own re-election bid next year. 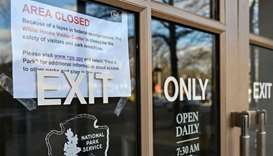 Facebook Inc Chief Executive Mark Zuckerberg told Congress in written testimony released on Monday that the social media network did not do enough to prevent misuse of data and apologised. India's ruling and main opposition parties on Monday accused each other of using social media dirty tricks to mine and share followers' personal data. 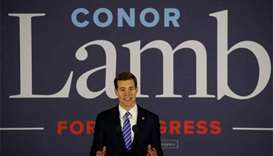 With more than 99% of precincts reporting in southwestern Pennsylvania's 18th congressional district, young Democratic candidate Conor Lamb declared victory in a speech to cheering supporters.